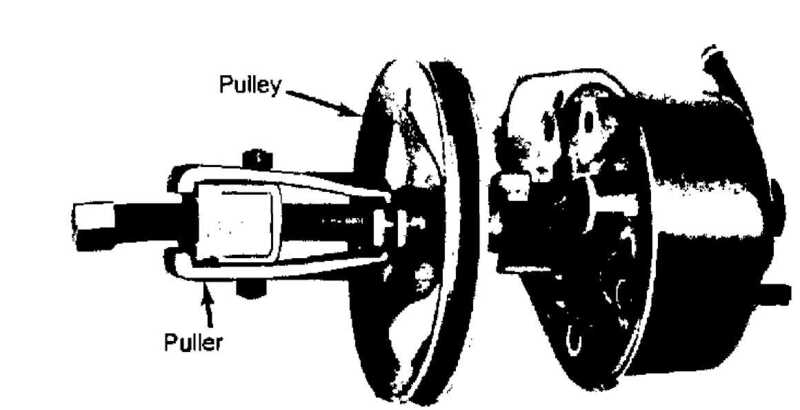 Saginaw vane-type power steering pump can be identified by "ham-shaped" fluid reservoir can. Rectangular pumping vanes carried by a shaft driven rotor move fluid from intake to pressure cavities of cam ring. Centrifugal force throws vanes against inside surface of cam ring to pick up residual oil. As more oil is picked up, it is forced into cavities of thrust plate, into 2 cross-over holes in cam ring and pressure plate and into a high pressure area between pressure plate and housing end plate. 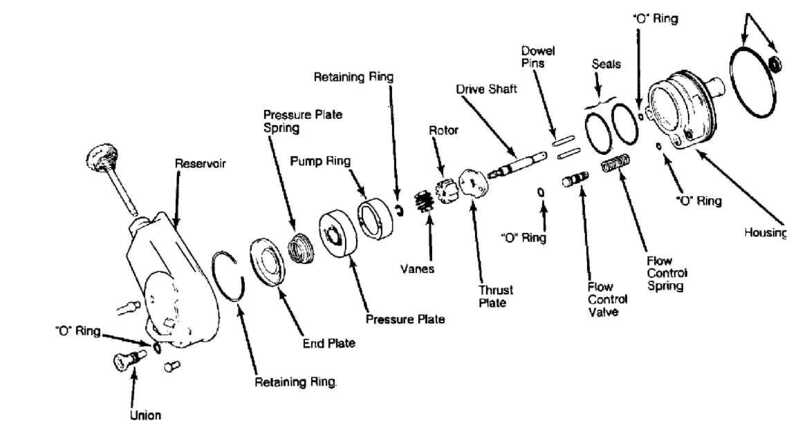 Filling the high pressure area causes oil to flow under vanes in slots of rotor. This forces vanes to follow inside oval surface of cam ring. As vanes rotate to small area of cam ring, oil is forced out from between vanes. 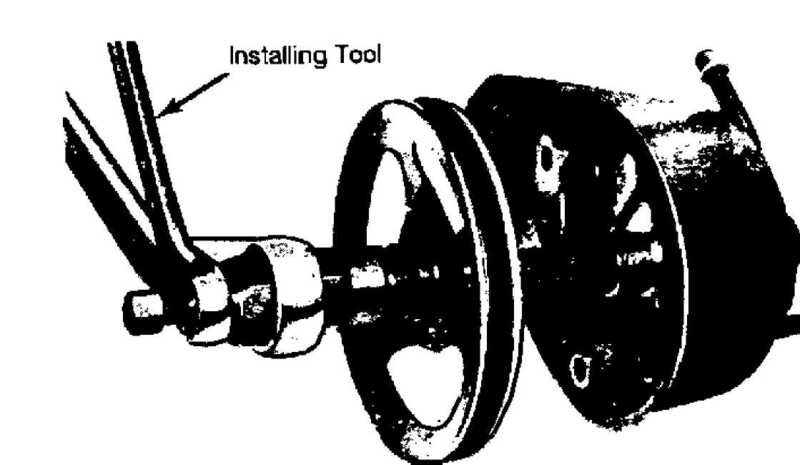 See POWER STEERING GENERAL SERVICING article in the STEERING section. from pump. Cap ends to prevent loss of fluid or contamination. excessive force on front hub or pump. DO NOT use hammer to remove pulley. 1) Drain pump reservoir. Clean exterior of unit. Remove mounting bracket(s). Using a puller, withdraw pulley from shaft. See Fig. 1.
line union and "O" ring. Remove reservoir retaining studs. from body. See Fig. 2.
tension should push plate up. Remove spring. Remove pump from vise. hammer, tap end of drive shaft to loosen pressure plate, rotor, and thrust plate assembly from body. Using a screwdriver, pry drive shaft oil seal from body. Lift pressure plate and cam ring from rotor. Remove rotor vanes. not to nick shaft or rotor. Slide rotor and thrust plate off shaft. score marks that would allow oil to by-pass outer seal surface. body drive shaft bushing for excessive wear. and burrs. Polish with oil stone (if necessary). freely but fit snugly into slots. If vanes are loose in slots, replace rotor and/or vanes. "O" rings. Install on pump body. counter bore down, over splines. locating holes with dowel pins. prevent cocking end cover in bore or distorting assembly. maximum retention of retaining ring. 10) Using a soft-faced hammer, tap reservoir down on pump. Install flow control valve spring and valve assembly slotted end up. Install new "O" ring on pressure hose fitting uppermost groove. CAUTION: DO NOT install pressure hose "O" ring in lower groove. This will restrict relief outlet orifice. 11) Install pressure hose fitting. Tighten mounting studs.